Easy Gift Finder – eBay App, provides and extremely easy way to locate the best gifts on eBay! It allows you to browse the most popular and most watched items and filter by category. Let’s say you need a gift for someone that is in to shoes, just browse the shoes category and find the most popular items being sold on eBay. The app also allow you to pull up over 300 ebay daily deals, and unlike the ebay.com site you can instantly filter the deals by price and text. 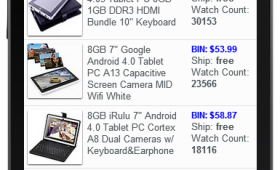 For instance if your looking for a tablet then just start typing the word tablet and see only the table deals. When you find an item you like you can save it to your favorites page, view it on ebay.com, or even share it with your friends. 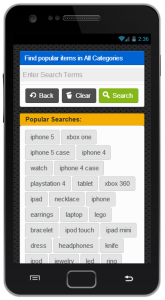 Search using popular keywords or your own search terms. It will even suggest new search terms based on what you enter. Then you can sort by savings percentage, deal date, and price. You can even save all the different types of searches for easy access later! All great tools allowing you to find that perfect gift. – Browse the most watched items, most popular, and daily deals on eBay. – Filter by category or see all categories. – Sort by price, most watched, and savings (for daily deals). – Search the most popular eBay items by entering keywords. – Popular, Alternative, and Related search terms are presented when searching for popular eBay items. – Easily save favorite items. – Save favorite lists of items for easy access later. – Open an item in the eBay app or on ebay.com. Available on iPhone, iPad, and Android devices..